Following an intense week of executive level reviews, a decision has been made on the configuration for NASA’s new launch vehicle. With NASA administrator Charlie Bolden agreeing to a configuration which is heavily derived from the retiring Space Shuttle, an official announcement is likely to be made on July 8, coinciding with the Shuttle’s final launch date. Months – if not years – of studies and reviews have surrounded the selection of NASA’s new Heavy Lift Launch Vehicle (HLV), only for the aforementioned studies to consistently provide a “winning configuration” known as the Shuttle Derived (SD) Heavy Lift Launch Vehicle (HLV). While the very nature of a SD HLV being the “best choice” for NASA is a point of conjecture in numerous arenas, the studies never led to any firm decisions being taken at the NASA leadership, or more importantly at the political level. With the President’s FY2011 budget proposal proving to be highly unpopular, the Senate’s Authorization Act changed NASA’s course and put its weight behind a Space Launch System (SLS) which utilized both Constellation (Ares) and Shuttle hardware. This Act was based on consultations between lawmakers, space industry heads and NASA managers on the best approach for both supporting the International Space Station (ISS) in the second half of this decade, prior to evolving into the required HLV for Beyond Earth Orbit (BEO) missions. However, the Act’s requirements appeared to be met by a level of disapproval from NASA leadership, as yet more studies were ordered, resulting in the Marshall Space Flight Center (MSFC) led review of potential launch vehicle configurations via three RAC (Requirements Analysis Cycle) teams. As the RAC studies were continuing, a preliminary report into the SLS from NASA also highlighted budget and schedule concerns – much to the surprise of some RAC team members – although the report was embedded with caveats in finalizing their costings and evaluations on its own claims. A final report to lawmakers is now well overdue, leading to frustrations surfacing from within NASA at even the management level. One of the more impassioned speeches came from Launch Director Mike Leinbach, who addressed his Firing Room workforce after the S0044 Launch Countdown Sim was completed. Paraphrased highlights from the speech quickly became the subject of high praise from those who had worked the sim. 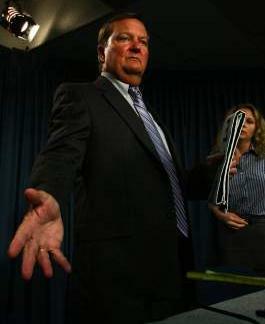 However, a recording of what was actually said has since been acquired by this site, after the audio file spread throughout several NASA centers – again gaining nothing but praise for the highly respected manager – as it provided one of what is believed to be many examples of frustration from within NASA. “For the final S0044 folks, what I’m about to say would not be appropriate on launch day, and this is our last chance to talk together,” noted Mr Leinbach over the recorded Launch Director loop (transcribed from an audio recording via L2). “The end of the shuttle program is a tough thing to swallow and we’re all victims of poor policy out of Washington D.C., both at the NASA level and the executive branch of the government and it affects all of us – it affects most of you – severely. “I’m embarrassed that we don’t have better guidance out of Washington DC. Throughout the history of the manned space flight program we’ve always had another program to transition into – from Mercury to Gemini, and to Apollo to the Apollo-Soyuz test program, to Skylab and then to the shuttle – we’ve always had something to transition into. “And we had that, and it got cancelled and now we don’t have anything, and I’m embarrassed that we don’t. Frankly, as a senior NASA manager, I’d like to apologize to you all that we don’t have that – so there you are. I love you all, I wish you all the best. As the loop was opened, rapturous applause could be heard ringing around the Firing Room. However, a follow-on vehicle is close to being officially announced, following an increased amount of activity at the executive level this week, resulting in a top level meeting between the SLS leadership and NASA administrator Charlie Bolden, which finally picked the configuration. While the boosters are highly likely to be five segment motors, the “initially” reference was explained, noting the evolved BEO SLS is yet to know if it will ride with SRBs or Liquid boosters. However, ATK have been quick off the mark in informing NASA’s leadership they are ready to support, not just with the initial SLS, but also into the future, via the 130mt class vehicle. According to source information, the Utah-based company – and home of the RSRM (Reusable Solid Rocket Motor) – have proposed a Firm Fixed Price (FFP) contract for 10 boosters, available between 2012-2015, whilst noting available assets that can support up to 11 SLS missions prior to asset depletion in 2020. This is notable, given ATK are proposing the initial use of boosters in their expendable mode, thus eliminating several hundred million dollars worth of recovery and refurbishment costs. Sources also add that ATK’s approach from a “cost and schedule” standpoint has been highly impressive. As far as ATK’s approach for the fully evolved SLS vehicle, source notes claim a future static test could be provided as a pathfinder test for an upgraded booster. 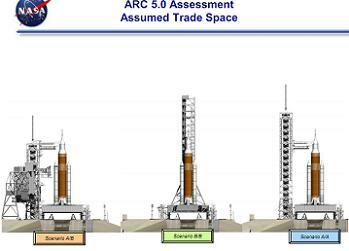 KSC information has also noted that preliminary assessments will be used to find a use for the Ares I Mobile Launcher (ML), currently sat near the Vehicle Assembly Building (VAB) with no future role to play, following the cancellation of the Constellation Program (CxP) and thus its main customer, the Ares I. Presentations on the 21st Century Launch Complex proposals (L2) – a stunning set of documents which include the “Point Of Departure” Architecture overviews (and will be the focus of upcoming articles) – also mirror the comments which point to the SLS joining forces with the Ares ML, as much evaluations are continuing into a need for the ML to play a role until the evolved SLS. “Allocate ML for SLS. Modifications to support SLS architectures, with scarring for extensibility. Incorporate standardized interfaces, using mobile launcher to adapt to vehicle requirement,” noted the Architectures Refinement Cycle 5.0 section of the latest presentation (in June) via L2. It is also understood that Boeing will be the main contractor for the SLS vehicle, likely explaining their work at the Michoud Assembly Facility (MAF) on a small scale strongback core, as much as it is likely the first SLS test flight will utilize the stored Light Weight Tank (LWT) ET-94. 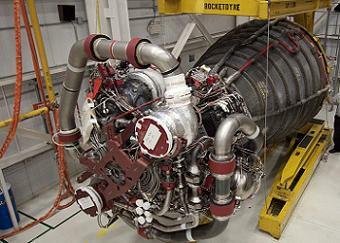 The role of Pratt & Whitney Rocketdyne (PWR) appears to be secure for at least the opening gambit of the SLS growth towards its 2016 IOC (Initial Operating Capability), with 12 RS-25Ds available for one-off roles with SLS flights, following their transition from the Space Shuttle Program (SSP). 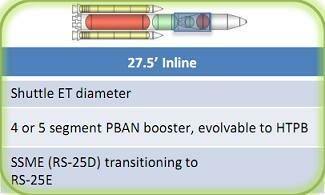 It is not yet known if a transition to the expendable RS-25E will be made after the four sets of RS-25Ds have been used. After being the long lead item for Ares I, the Upper Stage J-2X is continuing to make progress, after recently becoming housed in the A-2 Test Stand at the Stennis Space Center (SSC). Beginning in mid-June, the engine will undergo a series of 10 test firings that will last several months. “An upper stage engine is essential to making space exploration outside low-Earth orbit a reality,” said Mike Kynard, manager of the J-2X upper stage engine project at NASA’s MSFC in a recent public statement. It’s role with the SLS was one of the initial key requirements ordered by General Bolden, after he rejected the two-phase SLS approach. 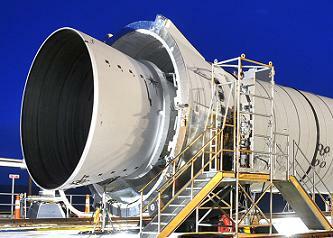 (The progress on the SLS status will continue to be followed up over the coming weeks. L2 members, follow our exclusive SLS update coverage via the SLS and HLV tags. Images used: Via L2 content and NASA.gov – plus Mr Leinbach photo via Brian Papke, MaxQ Entertainment/NASASpaceflight.com).